Comparing the Stonfo boxes to the others, they appear to be much better quality and much more robust than the newer ones. I’ve got 4 of these which are over 10 years old, they all work as well as they did on the day I bought them! The depth of the boxes mean they fit nicely into the drawers on your seatbox. Most of my hook boxes stay at home, my hook tying is done in front of the TV as it saves time on the bank. The boxes make handling hooks much easier and straight forward. How many times have you opened up a new pack of hooks and ended up shooting the lot onto the floor? No matter how good your eyesight is, searching for size 20 hooks in mud, grass or stones is never a fun task – and you will never find all of them! Packets of hooks also have a tendency to get picked up by the wind if you have then out on your table, so with these magnetic boxes there will be no more scooping packets out of the margins with your landing net! How do the hook boxes work? 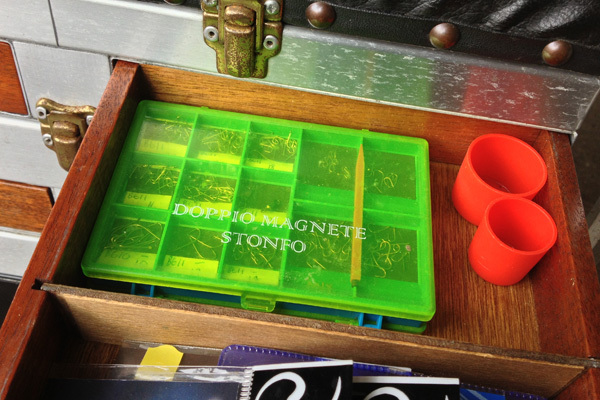 The idea is fairly simple, the hook box is split into a series of magnetic sections which you simply tip hooks into. The hooks then stick to the magnetic areas and are then held in place until you need them. The boxes are double sided with an opening clasp on each side. The boxes come with a little pen/stick which is used for getting a hook out of the box. The pointy end of the stick is used to drag a hook down from the magnet onto the plastic area. The other end of the pen has a magnet on which could then be used to pick up the hook – this isn’t something I use, I’m normally able to pick up the hook from the plastic area. If you fish a wide range of venues which require different bait approaches then you will likely have a big range of different hook patterns in your box. I cut out little labels and then stick them in which say what pattern/size the hooks are. I used to write straight on the plastic, but using a label it is easier to remove and add a new one if you change things around or swap patterns. When you are loading up the box with new hooks, take care! If you tip 10 size 24 hooks into the wrong compartment that is already full of size 22s, then that will be a fun sorting task to separate them out! I find the best way here is to use the magnet on the pen, you can pick all of the hooks up using that and then transfer them into the correct compartment. The worst thing that can happen is getting moisture into the box. I’ve seen quite a few people add a few grains of rice into the compartments to help absorb any moisture. This isn’t something I’ve tried, but in principle it sounds like a good idea. If you have any other tips or other favourite unsung heroes of your tackle boxes, then let us know in the comments below!